It’s a big year for Glenkinchie Distillery, an extremely popular destination for visitors who fly in to Edinburgh Airport. Among the reasons for celebration, 2017 marks the distillery’s 180th anniversary, and the 20th anniversary of its visitor centre. There has been an extension of activities with the addition of a manager’s tasting, and work is under way to create a new entrance and reception area. This all makes a trip to Glenkinchie even more of a pleasure than it was before. The distillery is open all year round for visits and tastings. There is a shuttle bus service from Waterloo Place in central Edinburgh three times a day. 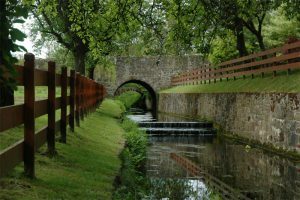 The cost of a visit is all inclusive – it covers transport, a guided tour and the tasting of either two or four whiskies. 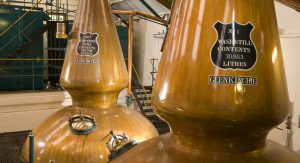 In 2016, Glenkinchie had approximately 42,000 visitors, and is expecting greater numbers this year. In the visitor centre you can explore an exhibition and museum located in the former maltings with a unique model distillery built for the Empire exhibition in 1924-25. You can then join a guided tour of the production area where you will get a fascinating insight into the making of Glenkinchie, known as the ‘Edinburgh malt’. This tour includes a visit to the distillery warehouse where you can experience the ‘angels’ share’ followed by a guided tasting of the light, delicate and fruity Glenkinchie 12-year-old single malt. “We want everyone who comes to us to have the best experience possible,” said Gemma Gascoigne, Brand Home Manager at the distillery. Notably, there are currently four expressions of Glenkinchie’s single malt available –more than at any time since 2010. These include an exclusive 24-year-old that was issued in late 2016, and can be sampled on site. Because Glenkinchie is part of the Diageo group its ‘whisky emporium’ and tasting bar includes a range of whiskies, allowing you to learn all about Scotland’s most famous product.